Autumn is here and I couldn't be happier to see the end of summer as the weather over the past few months has been so muggy, humid and warm which I hate! It's started to become chilly and I love it as it means, layering, tights, boots and all of the knitwear I could possible wear. I was very kindly sent a few autumnal products to try out from the lovely people at Sammydress. The first item I chose was the *Sammydress Short Sleeve Flare Red Dress ($10.43) which is the kind of dress I wear pretty much everyday. I love t-shirt dresses, they are so quick and easy to style and they are so comfortable too; plus they hide food babies really well...The colour is perfect for the autumnal and christmassy seasons. I've just paired it with black tights (Primark, obviously), Newlook ankle boots and my Newlook faux leather jacket. My favourite item is something I wouldn't usually choose but I'm in love with it; the *Sammydress Crossbody Star Bag ($12.88) which is just perfect. The bag came so cutely packaged, I think the brand logo is a bear and it's adorable. The bag is bigger than I thought it would be, it's also really thick, durable and sturdy. It comes in gold, silver and black, I love the gold, it's gorgeous! I will be using this bag so much throughout halloween, christmas and new year. The last three items are gorgeous t-shirts that are perfect for layering and more importantly lounge wear because lets be honest, the autumn/winter months are ALL for lounge wear and cozy pyjamas! My favourite t-shirt is the *Sammydress Letter Print T-Shirt ($8.22) which is currently sold out in the size I have which is M, medium. 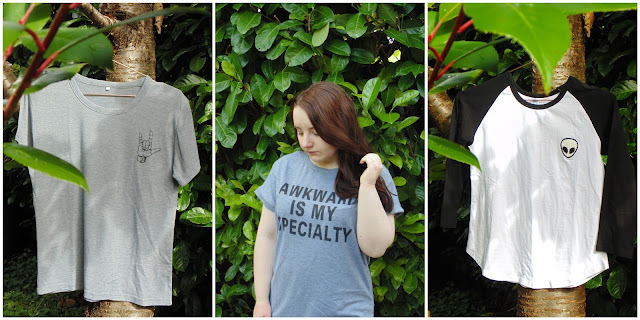 The T-Shirt says 'Awkward Is My Speciality', well it spells speciality differently but I am still getting so much use out of this tee. The slogan couldn't sum me up better; also the fabric is SO soft! I also have the *Sammydress Simple Scoop Neck T-Shirt ($6.74) which is also so so soft, it looks and feels like it is from Topshop! I love the simple design, it is perfect for everyday and lounge wear. The last one I had to get because it's a bit halloweeny (if that is even a word!? ); the *Sammydress Alien Print T-Shirt ($10.92) which is a 'one size' T-Shirt. The fit isn't great on me, it's a little short and a little tight and I'm a UK size 8-10, I'm still going to wear it as I LOVE the little alien and raglan design. Overall, I love all but one of the items, the one I wasn't crazy about is the alien t-shirt and that's just because of the fit, not the quality or design. I am so happy with the dress, bag and grey T-Shirts and I can't recommend them enough! The quality is fantastic, I love the simple designs and the prices are amazing! Sammydress also has an app which you can download from the app store. What do you think of the items I chose? Have you bought from Sammydress? That bag is absolutely amazing, I love it! That bag is so cool! I really love that! You look so pretty girl! That starfish purse is such a great statement piece, it looks great with that red dress! You have a great eye for fashion! Love these tshirt/dresses, great for lounging as well! omg, could you look any better! So beautiful and that dress.. FAB!